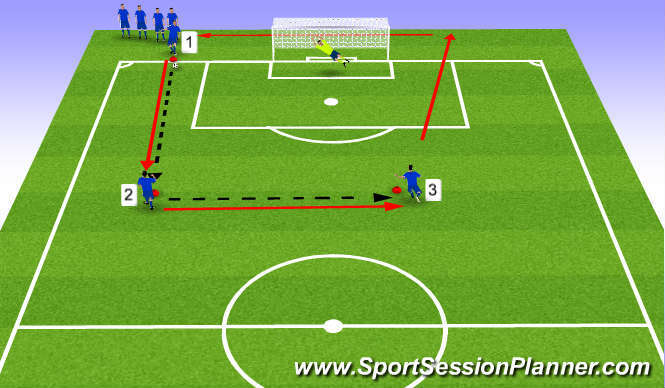 This is a very effective shooting practice in a warm up before a game. Its also very simple but teachers them loads. Player 1 passes to Player 2, Player 1 then follows his pass, Player 2 takes 1 touch to control then 1 touch to pass to Player 3 and then follows his pass too. Player 3&apos;s first touch has to set himself up to shoot!!! the Player who shoots then goes to the back of the starting queue.,. Good technique, weight of pass, use both feet, good control, good set up with first touch when shooting, good connection and body shape on shot.